87, of Honolulu, passed away May 31, 2018. She was born in Honolulu. Survived by sons, Lawrence G. (Elizabeth) Dang, Wayne A. Dang and Randall M. (Linda) Dang; three grandchildren, Lianne, Christie and Jonathan; brother, Manuel Kau; sister, Amelia Lao. Visitation will be from 10:00 a.m. Saturday July 21, 2018 at Nuuanu Memorial Park and Mortuary, East Chapel. 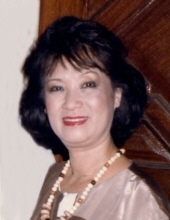 Service begins at 11:00 a.m.
To send flowers or a remembrance gift to the family of JENNIE Y.K. DANG, please visit our Tribute Store. "Email Address" would like to share the life celebration of JENNIE Y.K. DANG. Click on the "link" to go to share a favorite memory or leave a condolence message for the family.